Riding cooperatively with other cyclists, pedestrians, and motor vehicles is important for everyone’s safety and enjoyment. These apply to all users; pedestrians, cyclists, and skaters. Keep Right / Move Right. Just like on the road, always keep to the right except to pass. When two or three abreast, move quickly to the right for those coming from behind to pass on the left. Ring a bell. Do not shout on-your-left. On-your-left became popular in the U.S. for a brief period but has proven quite dangerous as many people move to the left when they hear this instead of moving to the right. The rest of the world uses bells and these generally work better for getting others attention, don’t confuse people with the need to move right when they hear the word left, and are much more pleasant. It is sometimes considered courteous on narrow or low traffic paths to give a ding of your bell when overtaking someone who is already keeping right. It is part ‘hello’ part don’t be alarmed that someone else is here and passing on your left. Unfortunately some people in the U.S. interpret this in the wrong way. Fortunately people are beginning to understand this better. Pedestrians generally have the right-of-way However, they should be aware of and courteous of other users. Lights. All path users should have lights at dusk, night, and dawn. Bicyclists should have a steady red light to the rear and a steady white light to the front (aimed down at the path in front of them, not at other people). Ideally bicyclists should also have a rear reflector, reflectors on pedals, and sidewall reflectors on their tires. Pedestrians should carry a flashlight and maybe have something reflective on as well. Note that flashing lights, front or rear, may be more dangerous than steady lights as they can interfere with others ability to gauge your speed and distance. Flashing lights have been outlawed in most countries for this reason. Earphones can be dangerous. They make it difficult or impossible to hear other path users, particularly those who are passing from behind. If you wear them it may be a good idea to only wear one and the volume low so that you can hear others. A person riding a bicycle has all of the same rights as any other vehicle and may legally ride on any roadway except were explicitly prohibited. Cyclists should obey all traffic signs and laws the same as other vehicles. Cyclists should ride on the road, in the same direction as traffic. It is illegal and dangerous to ride against traffic or on most sidewalks. 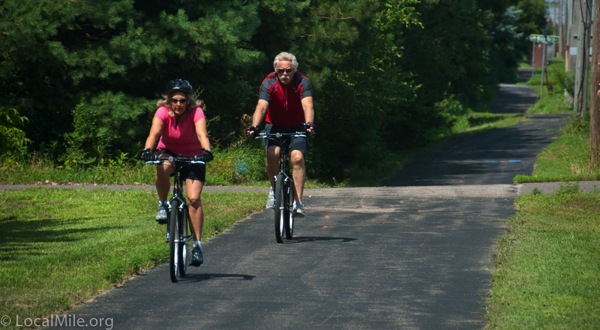 Faster cyclists are discouraged from riding on multi-use trails or bike paths and should use roadways instead. Use proper lanes at multi-lane intersections. Cyclists may ride two-abreast (though should be considerate of other traffic). Cyclists should ride as far to the right as practicable and safe. This does not mean on the shoulder or even to the farthest right possible, but is the farthest right that the cyclist deems safe. This may often be in the traffic lane. Shoulders are not bike lanes though they may be used as a bike lane at the riders discretion. Motorists and other vehicles must allow a minimum of 3’ at all times when passing. All vehicles, motorists and cyclists, must yield proper right-of-way. Path or Road? When choosing between a roadway and path, the dividing line is usually about 15-18 mph. Faster than 18 mph on the road, slower on the path. Note that, due to poor design, some paths have speed limits lower than 18 mph. Bicycle riders do have, for their own safety, considerable discretion in where they ride. A slower rider may choose to ride on the roadway instead of an adjacent path for a number of reasons including a path that is too narrow, in poor condition, crowded, has dangerous obstructions, or is otherwise deemed not as safe as the roadway. Faster riders may choose to utilize a path if the roadway is exceptionally dangerous though they should be respectful of other users and slow down when necessary. There’s an interesting symbiosis happening between young and old – cycling. Not spandex clad recreational, but whatever we already have on hop on the bike and ride to lunch. While cycling is growing across all age groups, these two, under 35 and over 55, have been growing the fastest, and not so much for recreation, but for daily transportation. At the same time, the average number of miles driven by 16 to 34 year olds fell 23 percent; from 10,300 in 2001 to 7,900 in 2009. By 2010 the number of these young folks with a drivers license had fallen to a low of 73 percent. Both were still flat as of January 2015. Venerable car magazines Motor Trend and Road & Track have been wondering why young people no longer seem interested in driving or owning a car. And AAA, the American Automobile Association, is introducing roadside assistance for cyclists in many cities. Both young and old appear driven initially by a combination of money and health. A number of social scientists have pointed out that young folks today would much rather have the latest phone than a car (though many are OK with both). Interestingly, this applies to some of the older folk as well! Once they begin cycling though, their reasons shift to enjoyment and convenience. Here’s a quick look at why we’ve seen this growth and why cycling and walking are expected to grow even faster in the coming years. Enjoyment. Riding a bike is fun. Many of us rent bikes when we’re on vacation and it’s just as fun when we’re not on vacation. Well, so long as we have safe and comfortable facilities to ride on. Convenience. For shorter trips riding a bicycle is often easier and faster than a car. Health. As much as we may desire it, our bodies are not maintenance free. Next to eating well, moderate routine activity is the best thing we can do for our health. Increasingly we’re learning that short bits of activity spread throughout the day may be much better for us than a massive one hour sweatfest at the gym. Walking and cycling to get where we need to go—active transportation—is one of the best ways to get this activity. Incidentally, driving a car is the least healthy activity, or non-activity, that most of us do each day. It’s even worse than watching TV. Besides the immediate benefits of reducing our weight and helping us to feel better throughout each day, routine walking and cycling also reduce the likelihood of longer term health issues such as joint problems, cardiovascular disease, diabetes, and Alzheimer’s. These activities also prolong coordination, muscle tone, and mental acuity as we age. Here’s an entertaining 9-minute video on the topic by Dr. Mike Evans. You also stand a much better chance of surviving any kind of surgery if you regularly ride a bicycle or walk according to a new study from the Royal College of Surgeons in Edinburgh. Deaths after surgery can be as high as 22 percent for those with low levels of fitness but are about 4% for those who regularly ride or walk. Mental Health. Numerous studies have found that those who are moderately active throughout the day are mentally healthier, more creative, less stressed, and are better able to deal with stress. Children’s Development. Walking or riding a bike to school helps children’s social, physical, and maturity development in a number of ways such as developing social skills as they interact with other children of varying ages and developing coordination from balancing, pedaling, steering, and watching where they’re going . Both activities require and develop a bit of responsibility and maturity, particularly as they grow older and walk or ride on their own instead of with a parent or as part of a bike train. Cycling properly develops an ability to follow rules and helps them to understand why these rules exist and why it’s important to obey them even when a teacher isn’t watching. Children’s Academics. We’ve known for some time about the mental benefits of physical activity. To put a point on this, a recent study in Denmark has shown that children who ride a bike to school are about half a year ahead of other children in concentration – a key element of their ability to learn. Money. Cars aren’t cheap. Even a very basic 4-year-old Chevy Cobalt that you pay $10,000 to purchase will cost you about $41,000 over the next 5 years (depreciation, financing, insurance, maintenance, fuel, tires, brakes, and taxes). And this is assuming you don’t get any costly and insurance rate busting tickets. Each mile we choose not to drive saves us about $1. Or considerably more depending on what we drive or if we have to pay for parking. A four mile round trip to the store costs us about $4 in a car or $0.12 on a bicycle (not including health benefits). Not owning a car, or having only one instead of two, can save anywhere from $6,200 per year to an average of $9,400 per year, or more. The savings are greater for the couples who are choosing to own only one car and don’t incur costs of a rental car for weekend getaways. This lifestyle choice is also influencing where many choose to live. Safety. 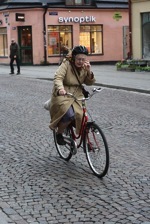 Cycling or walking, on safe and dedicated facilities, is considerably safer than driving a car. Even riding on the road with traffic, if done safely, appears no more dangerous on a bike than in a car (though it may feel more dangerous, statistics say otherwise). On the flip side, many older folk, concerned about endangering others when they drive, are choosing to ride bikes to their morning coffee klatch. Social. I often don’t even recognize good friends behind the glare of their windshields. Driving is rather anonymous and sometimes almost anti-social. Walking and cycling though, promote social interaction with our neighbors (and most would rather hear our bike than our car). Most of us ride our bikes primarily for personal reasons such as enjoyment or saving money. There are many other benefits to cycling however and numerous reasons why cycling and walking, even for just our shorter trips, are better for our communities as well as for us personally. Crashes. Traffic crashes are costly. Not only the painful loss of family and friends but also financially. We in the U.S. are three to four times as likely to die in a vehicle crash as someone in The Netherlands, Denmark, or Sweden. We have the most dangerous road system of all developed nations. Injury statistics are even worse. We all share in the costs of these crashes, directly and through higher taxes and higher auto and health insurance premiums – repairing the vehicles and other stuff that’s damaged and repairing the people who are damaged but survive. Healthcare. Healthcare is increasingly expensive for all of us and a large part of this increased cost is self-induced – we don’t take care of ourselves. We spend over $9,000 per person per year on healthcare (as of June 2015) – over twice what other developed countries with more active lifestyles spend. In three years we are expected to spend three times as much. Cycling and walking for some or all of our transportation not only helps us individually but a more active walking and cycling culture will reduce the increasing shared costs that we all bare. An obese person costs about $9,882 per year more than a non-obese person. An active person costs about $1300 per year more than a sedentary person. Add these together and we’re talking real money. While most companies have been seeing increases in healthcare costs, QBP in Bloomington MN has seen a 4% decrease which according to an in-depth study by Health Partners is due to their very high number of bicycle commuters. Obesity. The costs of obesity alone are significant. Even discounting for lower life expectancy, obesity is likely the single biggest element in rising healthcare costs and each of us pays for these costs with higher taxes, higher insurance premiums, and higher costs of goods. It’s not only the costs of treating our massively increased rates of diabetes, cardiac, joint, and other problems caused by obesity, but also basic stuff like the need for special beds, wheelchairs, and operating tables able to handle the extra weight. Restaurants have had to reduce the number of seats so that they can fit in larger booths for obese folk. Every ounce costs when flying and airlines say that they lose considerable money on obese passengers. It all adds up to our national weight problem being a significant expense – for every one of us. Land Use. In a century of building and expanding roadways, we have never been able to build our way out of automobile congestion. We increase road and parking capacity and within a couple of years we’re back where we started. Much of this is induced demand – build it and they will come. And they keep on coming. Cars simply require huge amounts of space – to manufacture, sell, refuel, maintain, and discard. And more than anything, to drive and park. Eventually we begin to run out of space for roads and parking. Consider that one mile of 6’ wide bikeway can transport over nine times as many people as one mile of 12’ wide roadway. But wait, there’s more (RIP Billy Mays)! Cycle and pedestrian networks are mostly non-blocking. Cyclists and pedestrians can, in most cases, quickly and safely negotiate around each other when they intersect, cars though, require stop signs, stop lights, and queuing space. Many multi-lane roadways are multi-lane, not because of traffic volume, but to deal with queuing at junctions. The only time pedestrians and cyclists must stop is when interacting with cars. So we have a gob more pavement for queuing space (that is often only needed for about the peak 3 hours of the week). When you add it all up, each car requires, conservatively, over 17 times as much roadway as each bike. Some have put it as high as 35 times. Parking is worse. Each car or bicycle we use requires just under four parking spaces to exist for our use (at work, shopping, church, government, entertainment, etc. ), not including personal driveways or garages. This results in about 38 square feet of space for each bicycle (and that’s being quite generous, northern Europe packs ’em in about a quarter this much space) or 800 square feet for each car – 20 times as much space for cars as for bicycles! Water Conservation. This relates closely to land use and, given recent problems with low lake levels, is particularly prescient. It’s also interesting to note that Ramsey county has combined surface water management with transportation management due to the increasing impact paved roads and parking are having on our water supply. Think about all of the land use above. All of that asphalt and cement. Even when we do a good job of capturing run-off in to holding ponds instead of sending it down the Mississippi, it doesn’t all percolate down to the aquifers. The holding ponds and rain gardens are too small. You can’t take 50,000 square feet of surface and force it through 2,000 square feet. But sadly, much of our asphalt surface doesn’t even get that chance, it drains directly to the Mississippi. Air Pollution. Though significant from operating cars and buses there is also pollution created in the manufacture of each car and creating the fuel for our cars, and transporting fuel from oil fields to refineries to gas stations. Air quality analyses also indicate high levels of debris from brake pads and tires that are quite toxic and believed to contribute to pollution. Water Pollution. Would you drink water off of an average street? Oil and fuel leaks from cars are a significant source of pollution. Then there are fuel spills from crashes (cars, tanker ships, gas trucks, and trains), leaky underground storage tanks and pipelines, as well as water pollution created by refineries, car manufacture (cars and all of the parts that go in to them), and junk yards. Noise, Light, and Comfort Pollution. For most of us, a street of cyclists and pedestrians is considerably more pleasant than one of cars. Bikes and pedestrians are quieter, don’t alarm people as much speeding by, and don’t splash as much through water, snow, and slush. They don’t need as much or as bright of lighting (on the bike or overhead). Litter. People walking or riding bikes are much less likely to litter than those in cars. This may partly be due to people in cars feeling somewhat removed from their surroundings – they’re in their car, not ‘out there’. Energy Consumption. Bicycling burns calories, not oil. Energy Consumption II. Consider the energy used in the manufacture of cars and all of the parts that go in to them and transporting the parts and cars and running the showrooms and service garages and transporting spare parts and making the fuel and transporting fuel to gas stations and even a bit to dispose of the car at the end of it’s life. Then there’s all of the energy required to build and operate all of the manufacturing plants and showrooms and refineries. Each square foot of road or parking surface consumes a bit of energy to grade the land, make the asphalt, and lay the asphalt. Cars are heavy and create more wear and tear on parking lots and roads requiring more energy to tear out the old and put in the new. Costs of Road Construction and Maintenance. Cars require a lot of space to drive and park and all of these roads and parking spots have to be constructed, maintained, and rebuilt occasionally. With cars it takes a 3900 pound vehicle to transport a 150 pound person, with bikes it takes a 30 pound vehicle to transport that same person. That extra weight means a lot of extra wear and tear on the roads requiring much more frequent repaving and reconstruction. According to a GAO Study, one 80,000 lb truck driving over a road causes the same damage as between 5,500 and 9,600 car trips over this same road. Each car trip causes about 3,800 times as much damage as a bicycle trip over this road. Replacing just 10% of our car trips with bicycles could potentially double the lifespan of many roads (the wear from cars is greater, but other factors such as weather limit roads lifespan as well). But it’s worse. All of those roads and parking space are not only expensive to build and maintain but are largely off the tax rolls. Where a piece of land might have once had four businesses on it, today it has a single Wendy’s and a gob of parking. That parking doesn’t generate revenue (not to mention the health problems that all of those Baconators cause). Reduce Crime. The presence of people walking and riding bicycles is a deterrent to crime. Criminals feel safer around people in cars because they know that drivers are less likely to notice what they’re doing and even if they do notice, they’re less likely to stop or do anything. Increase Local Business. Someone on a bike is much more likely to stop in and purchase something than someone flying by in a car at 40 mph. People walking along a sidewalk are more likely to hang around and shop if there aren’t cars flying by. Many retail businesses around New York were against the installation of bike lanes and bike parking out of fear that the reduced driving lanes and parking would negatively impact their business, now they’re offering to pay to get bike parking in front of their business after seeing the increase in business when protected bikeways were installed. Each trip or mile each of us walks or bikes is a bit less pollution. Each is a bit less energy consumed, a bit less healthcare and crash cost we all must bare, and a bit less maintenance costs of roadways. Each mile is a bit less congestion, a bit less crime, and a bit less roadway and parking space that will need to be built. Even just riding our bike to dinner instead of driving one day per week is beneficial. 3 – Is Cycling Safe? 3 – Is Cycling Safe ? You are much less likely to be injured or killed while riding your bike to the store on a safe cycleway than driving in a car. Deaths between cyclists, even in The Netherlands or Denmark, is extremely low. This is a key reason that we in the U.S. are about four times as likely to die in a transportation related crash as someone in northern Europe. Even riding a bike in traffic lanes on roads without appropriate cycleways appears only slightly more dangerous than driving on these same roads in a car. Statistics indicate that cyclists on roads in the U.S. are about twice as likely to be injured or killed as people in cars, but when you dig in to these statistics you find that the majority of these are cases where the cyclist was at fault, usually for doing something quite stupid such as unexpectedly darting in to the path of a vehicle when the vehicle had the right-of-way. In short, riding on cycleways such as a multi-use path alongside a road, is safer than driving in a car. Riding on roadways, safely, is about the same or slightly more dangerous. I’ve ridden thousands of miles, the vast majority in the NE Metro. Drivers are, overall, very aware of people on bikes and very courteous. Last year I mounted a GoPro video camera under my seat to collect some statistics. About 99% of drivers do exactly as they should, they move over when they pass, they don’t pass when they’re about to make a right turn, etc. Only about 1 in 120 drivers didn’t do the right thing. AND, teens are among the safest. 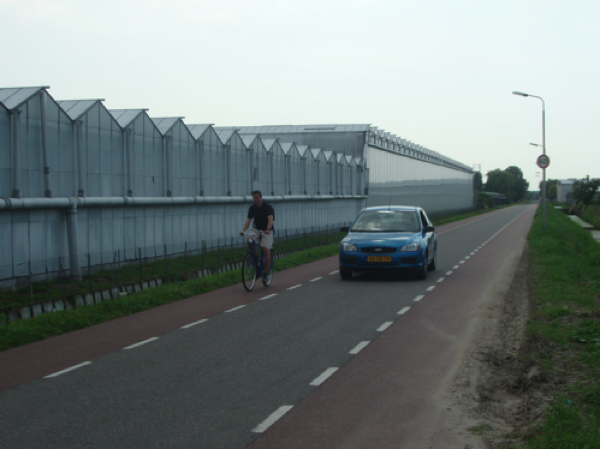 In his blog A View From The Cycle Path, David Hembrow makes some great points about perceived safety vs actual safety. Actual safety is reality. It is the actual likelihood of being injured. Perceived safety is how safe we feel. How comfortable we are from a safety standpoint. A great example might be riding your bike along the right edge of the right traffic lane on Centerville Road with gobs of cars passing you at 60 mph. This feels quite uncomfortable and unsafe. Statistically though, it is actually not very dangerous. Incidences of being hit by cars approaching from the rear are extremely low. But it still feels unsafe. No matter what the statistics say, I still very strongly prefer cycleways that are as physically segregated as possible from auto traffic. Even if I’m only marginally safer in reality, I feel much safer and more comfortable and that makes for a much more pleasant and desirable experience. Discussions of bicycle lanes, tracks, paths, and boxes can get quite confusing. Even for those of us who spend considerable time doing so. The following will hopefully provide a good overview for all of us and help to avoid some confusion. Much design and terminology is rooted in geographic location, primarily The Netherlands. Before we delve in to all of the types of cycleways then, let’s briefly look across the ocean. The Netherlands are widely regarded as the gold standard when it comes to designing for bicycling. To steal a bit from Winston Churchill, The Netherlands has the worst bicycle infrastructure there is, except all of the others. There are more bicycles in The Netherlands than there are people and about twice as many bicycles as cars. Between a third and half of the population rides to work each day and nearly everyone rides a bicycle for all shorter trips of 1 or 2 miles each way and many for much longer trips. The Netherlands is the safest place in the world to ride a bicycle and is also one of the safest for walking or driving. It wasn’t always this way though. Through the 50’s and 60’s they were on the same congested car-centric trajectory as the U.S. and other countries. In the early 70’s, noting the fatalities caused by drivers, they made a very conscious decision to encourage bicycling. The result has been quite dramatic and succesful for motorists, pedestrians, and bicycle riders. If you ride a bicycle in The Netherlands today, you will notice a few things about their facilities—speed and volume of motor traffic dictates the level of separation between motor traffic and bicycle riders. Or the space available for appropriate segregation dictates the speed and volume of motor traffic allowed. Bicycles do indeed Share The Road with cars (rarely trucks though), but only on local access roadways with a speed limit of 18 mph or less. Many residential roads have a maximum speed of 13 mph. Also, if the ratio of cars to bicycles is above 1:2 then they will install protected bikeways. Above 18 mph or a higher volume of cars and the roadway will include some form of bicycle specific facility; a bike lane, cycle track, or side path. Cycle tracks are similar to bike lanes but are physically separated from motor vehicle traffic. In the US these are often referred to as Protected Bikeways. Note that The Netherlands mostly no longer builds painted bike lanes and a cycletrack is the minimum facility that will be built. Above 25 mph, roadways will have cycle tracks (protected bike lanes). Above 30 mph, roadways will usually have cycle paths. With every 6 mph (10 kph) increase in motor vehicle speed there is a corresponding increase in the the buffer between the roadway and the bicycle path. For instance, a 40 mph road would have a buffer of 5 – 8 feet minimum while a 50 mph road would have a buffer of 15 – 20 feet. The wider buffer is for the comfort and safety of people riding bicycles and to provide enough separation from traffic noise that a conversation can be had. This all makes riding in The Netherlands quite pleasant and safe. In photo’s of The Netherlands you will notice that nobody wears a helmet. When asked why, they simply ask “for what purpose”? Bicyclists in The Netherlands suffer a head injury about once in every 900 lifetimes, less than 1/8 as often as someone in the US. Any street, lane, path or track intended for transportation by bicycle and marked for such by paint or signs is a cycleway or bikeway. A street where bicycles may legally ride but is not specifically marked would generally not be called a cycleway. There are three key portions of a bikeway; the path, minor junctions along the path, and major junctions. Each is important. Note: This symbol denotes facilities that work well for all users. In other words, from 8 to 80, including disabled. Most are based on Dutch standards and are the only facilities being built in The Netherlands. Facilities without this logo are those intended primarily for vehicular cyclists or other more experienced bicycle riders. 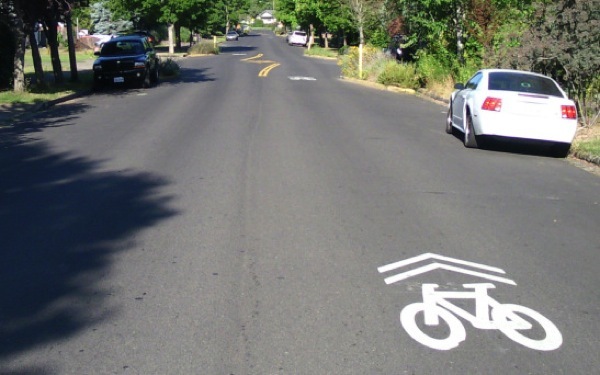 Sharrows are painted symbols on the roadway to tell motorists that the roadway is shared by drivers and bicyclists and to indicate approximately where bicyclists should ride. Sharrows have come under considerable criticism for not providing any real benefit and concerns that they make bicycling more dangerous because some drivers assume that bicycles are not allowed on streets without sharrows. Enhanced Shared Lane is a street shared by bicycle riders and motor vehicles and designated as such with paint or signs. Most will include Sharrows. Bicycle Boulevard is a street shared by bicycle riders and motor vehicles and designated as such with paint or signs. It is a ‘step up’ from an Enhanced Shared Lane. On a Bicycle Blvd the bicycle riders have right-of-way, motor vehicles are considered guests, and efforts are made to reduce through traffic and speeds. Cycle Street is a street shared by bicycle riders and motor vehicles. Bicycle riders have right-of-way and in many cases motor vehicles may not pass bicycle riders. Maximum speed is 18 mph though some will be 13 mph and others a ‘walking pace’. These are specifically designed to not allow motor vehicle ‘through traffic’ via Filtered Permeability — using short street segments, blocking longer streets to disallow through traffic, or using opposing one-ways. These are done on a neighborhood-wide basis to eliminate rat runs. Travel by motor vehicle is usually limited to about 1/8 mile while people walking or riding bicycles can travel much longer distances. A Cycle Street differs from a U.S. Bicycle Boulevard or Enhanced Shared Lane primarily in not allowing through motor traffic (vs only reducing through traffic), lower speeds, and not allowing motor vehicles to pass bicycle riders. Cycle Streets usually use 8-9′ lane widths which help to reduce motor vehicle speed and make passing difficult. 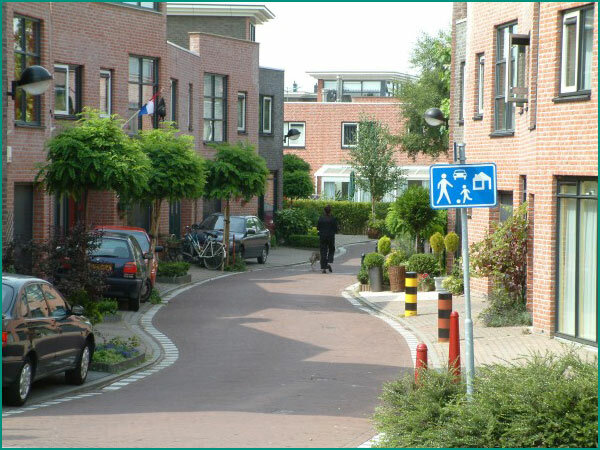 This is the standard for residential streets in The Netherlands. 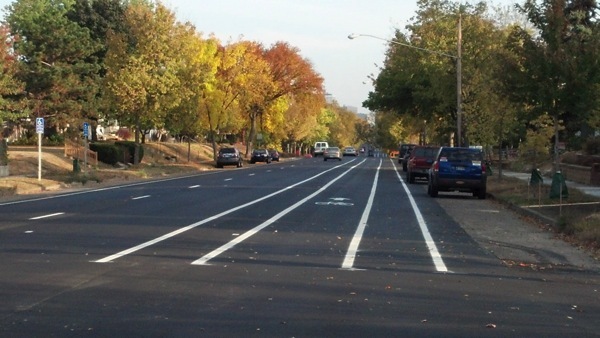 Bicycle Lanes are painted lanes on the roadway dedicated to bicycle travel. They provide no physical protection between motor vehicles and bicyclists. In Europe they are or were considered appropriate on roadways with speeds of less than 25 mph. The Netherlands has now discontinued the installation of any new bicycle lanes and now utilizes cycletracks (or protected bike lanes) only. Note that this bike lane is in the ‘door zone’ which is considered quite dangerous. The above could be safer and more comfortable if the bicycle lane were on the right side of the parked cars effectively making it in to a protected bicycle lane (and without requiring any more space) Click for more and why we may not want unprotected bike lanes. Side Paths may be two-way (as above) though are usually one-way and on each side of the roadway. Bike Lanes, Buffered Lanes, Protected Lanes, and Cycletracks are nearly always and should always be one-way and on the right side of motor traffic which is safer, particularly at junctions, and more comfortable. Cycle Paths may also be completely separated from a motor vehicle corridor. Since bicycles take little room and are very quiet these can provide routes that would not be appropriate for motor vehicles. The Mid-Town Greenway and Gateway Trail are local examples (though these are also MUPs which you will rarely see outside of the U.S. where bicycling and pedestrians are usually given separate and dedicated facilities). Multi-Use Paths (MUPs) are similar to cycle paths but allow multiple uses so will often include people walking, riding bicycles, inline skaters, and disabled. These can be relatively safe if all users obey proper path etiquette. If traffic on the path increases then users should be separated on their own paths. The Gateway Trail and the MUP along Hodgson Rd in Shoreview are examples of MUPs (and both should likely be segregated). This is the one place where I differ from most in that I consider MUPs a good and viable alternative while most people will say that there are too many conflicts between people walking and riding bicycles. Multi-Use Trails (MUTs) are unpaved trails for multiple users. In general transportation use a Path is paved and a Trail is unpaved. A woonerf will not allow through motor vehicle traffic. For motor vehicles they are a dead-end or cul-de-sac and intended for limited local access only. They will usually allow through walking or bicycling however, often referred to as permeability. 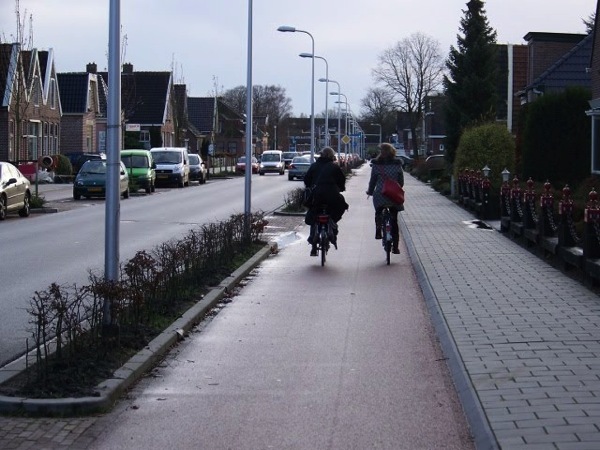 For example, two culs-de-sac connected together by a walking and bicycling path would be similar to a woonerf. People can walk or ride between them, but cars cannot. This significantly reduces motor vehicle traffic and speed resulting in a much safer and more pleasant neighborhood. Woonerfs come in many varieties such as the mews above, a street lined with shops, or a residential street with front yards and gardens. The Netherlands has largely discontinued the building of traditional Woonerfs with most residential streets now a cycle street shared by cars and bicycles with a speed limit of 18 mph. Complete Streets are streets for everyone. They are designed and operated to enable safe access for all users. People of all ages and abilities are able to safely move along and across streets in a community, regardless of how they are traveling. Complete Streets should make it easy to cross the street, walk to shops, and bicycle to work. They allow buses to run on time and make it safe for people to walk to and from train stations (from http://www.smartgrowthamerica.org/complete-streets/complete-streets-fundamentals). Typically a complete street will include a sidewalk on each side for pedestrians, a cycletrack on each side for bicycle riders and disabled on mobility scooters, and motor traffic lanes in the middle. Complete Streets are effectively a fancy promotion for Dutch style infrastructure though no implementation has yet attained anything comparable to a Dutch standard. 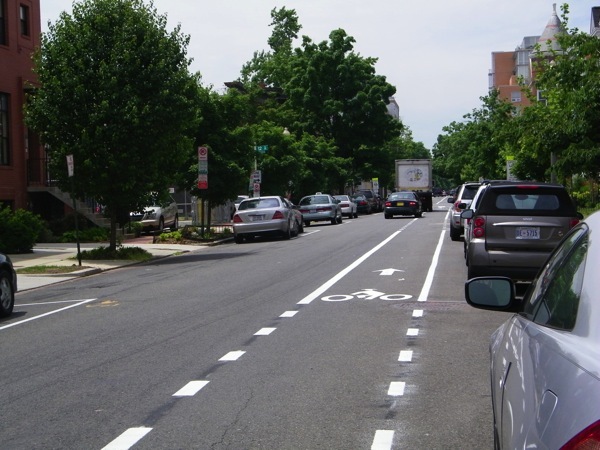 Note that the photo at the top of the Complete Streets page (and at left) is actually a quite poor design for a bicycle lane because it places riders next to the drivers side of parked cars. This increases the danger to bicyclists of being ‘doored’ by drivers exiting their vehicles or of being hit by drivers entering or leaving a parking space. Instead the bike lane and car parking should be reversed so that the bike lane effectively becomes a cycle track between the parked cars and sidewalk. Minor junctions are places where a cycleway intersects a minor motor traffic junction such as a residential driveway, parking lot entrance, or minor street. These can largely be categorized as Dutch and everything else. Dutch. Minor junctions in The Netherlands are distinguished by two key elements; grade and right-of-way. 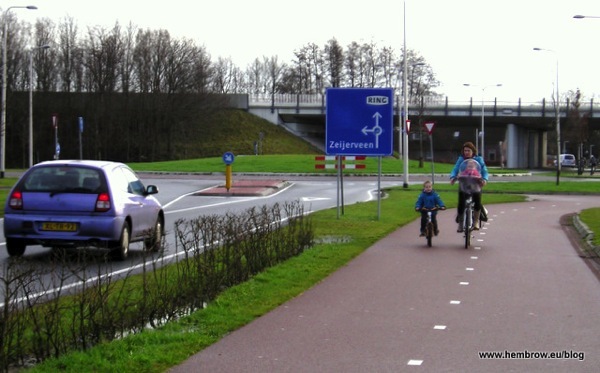 Cycleways in The Netherlands are designed to provide a safe, comfortable, and efficient experience. Curb cuts like we use and other jarring bumps are both a safety hazard and uncomfortable so a bicycle path will be designed for a relatively smooth grade across all minor and most major junctions to avoid these. Right-of-way is critical to these minor junctions. If bicycle riders have the right-of-way (nearly always) then the path color, material, and grade will continue unbroken. The crossing drive or street will rise or descend to path grade. This provides a very critical message to motorists that there is a bicycle path and that it does have right-of-way. If there is significant motor traffic then the bicycle path will be marked with paint and either motor traffic or bicycle traffic given ‘sharks teeth’ to indicate who has right-of-way. Other. Outside of the Dutch style designs above, which are seen in numerous countries, not just The Netherlands, are a hodgepodge of designs or non-designs. Some function OK, most do not. In some cases there is considerable ambiguity over who has right-of-way which is quite dangerous and in many there is no indication of the existence of a cycleway which also puts bicycle riders in danger. Dutch Junctions. The Dutch approach to junction design is for a very high level of safety and efficiency for all users; motorists, bicycle riders, disabled, and people walking. They believe that this is best accomplished through separation and that separation can be accomplished in both time and space. Time separation is through signal timing such as motor traffic never being allowed to cross a bicycle path when bicycle riders may be present. Here is a good example of a typical Dutch junction as explained by Mark Wagenbur. Simultaneous Green is another method of achieving this. Physical separation includes reducing or eliminating space in common. An underpass (tunnel) for bicycle riders is the preferred method of accomplishing this. Bridges or overpasses are also an option. Copenhagen Junctions. Copenhagen has traditionally taken an approach that mixes bicycle and motor traffic. This is sometimes a bit less costly than the Dutch approach and has worked relatively well in Copenhagen. Its success in Copenhagen is attributed to the much lower speeds of motor traffic, lower traffic volume, and a higher degree of consideration for others that may not exist in other cultures. They also have many fewer trucks. Copenhagen junctions are perhaps most typified by a protected cycletrack leading in to (or mixing in to) a right turn lane where bicycle riders going straight mix with motorists making right turns. The ‘Copenhagen Left’ is another example. Lessons From Copenhagen provides a very good overview. Vehicular Junctions. Vehicular junctions are those that include no special bicycle facilities or facilities only for vehicular cyclists, people riding bicycles along with motor traffic. Bike Boxes are boxes painted on approaches to intersections. The intention is to give vehicular cyclists a head start going through signalized intersections. In practice these are not considered safe for bicycle riders and are frustrating for motorists. Simultaneous Green. This is a signaling program that gives a red to all motor traffic and a green to all bicycle traffic. Bicycle riders may proceed in any direction all at once, including diagonal. These work quite well because bicycle riders can negotiate with each other as they intersect to avoid collisions. 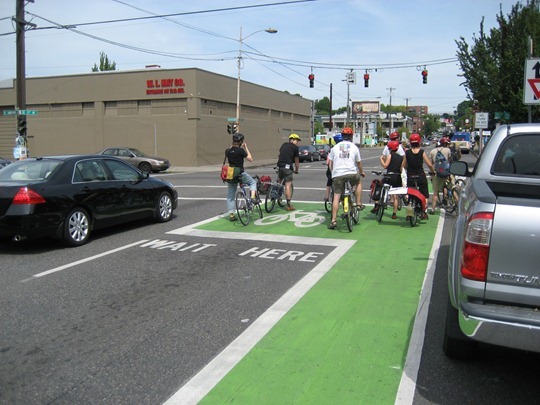 Simultaneous Green intersections have proven very safe and very efficient for all users; bicycle riders, disabled, people walking, and motorists. Vehicular Cycling is a term coined by John Forrester in his campaign for all bicycles and cars to share the road equally. In other words, bicyclists should ride as a vehicle. Two key problems with this are that; we have not yet figured out how to keep drivers from killing other people in cars (over 30,000 in the U.S. each year) so certainly will have difficulty keeping drivers from killing people on bicycles, and, most rational people are not comfortable riding a bicycle among 4000 lb motor vehicles. There is also a paradox built in to vehicular cycling in that if it were actually successful and many people did it then we would have massive congestion problems of cars lined up behind people riding 11 mph on their bicycles. We have problems now with very few vehicular cyclists, imagine if there were 10 times as many (which would get us to about 1/3 the number of bicycle riders as The Netherlands). Vehicular cycling is to some extent a good coping mechanism for situations where a safer segregated facility is not available. It should be noted that there are somewhat two types of vehicular cycling; American, as promoted by John Forrester, and European, as practiced by bicycle riders in Europe. The primary difference is one of consideration for others. European drivers have a greater degree of consideration for others than typical American drivers so European bicycle riders can more safely ride to the right than American riders who may need to ‘take the lane’ far more often. Vehicular cycling is appropriate for those riding over about 20 mph and training for a race or other fitness. In most countries, vehicular cycling on the roadways is limited when it will conflict with significant motor traffic and where there is a safe cycleway available. Those in The Netherlands and elsewhere who race or do training rides for fitness say that this has not been a problem. Segregated Bicycling is somewhat the opposite of vehicular cycling. This is what you see in The Netherlands and increasingly in other countries such as Denmark, Sweden, Finland, Germany, and elsewhwere. With segregated bicycling, motor vehicles and bicycles are physically separated except when motor vehicle traffic volume is very low and is traveling at very low speeds. Intersections are carefully designed for the safety and efficiency of bicyclists and drivers and so that there are no conflicts between them. Active Transportation (Sustainable Transportation) is simply using our feet, a bicycle, skates, or other forms of transportation that utilize our own human power. Active Transportation has shown to be the best way for people to remain healthy throughout their lives. Increasing numbers of people are embracing various forms of active transportation as more enjoyable and healthier than sitting in a car. Shared Space is a concept developed by Dutch traffic engineer Hans Monderman. His belief was that if roads were made to feel very unsafe, if all lines, signs, and other regulatory elements were removed, that motorists, bicycle riders, disabled, and people walking would be able to safely share the space. In initial trials this worked well but over time has proven unworkable. As drivers became more comfortable with the area their speeds increased and they soon dominated the space. The original shared spaces in The Netherlands are being removed by converting them to standard street design with the addition of crosswalks, bikeways, and other regulatory elements. The only one considered a success is in s’ hertogenbosch. London attempted a shared space on Exhibition Road and hired noted designer Ben Hamilton-Baillie to design it. Widely touted upon opening it has, like those in The Netherlands, quickly become dominated by motor traffic and today does not function as a shared space. Interestingly Mr. Hamilton-Baillie continues to promote the concept. 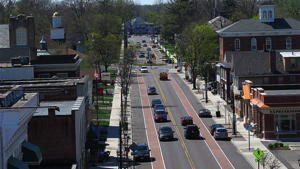 Stroads are street/road hybrids that mix high speed high volume traffic with retail and residential uses. Stroads are dangerous for everyone and make adjacent retail and residential areas uninviting. Hierarchical Road Network is an ordering of roads based on their function. In the U.S. at the base are local streets that are mainly intended for local access in residential neighborhoods. Next are collectors, then minor arterials, major arterials, and finally limited access highways such as Interstates. Generally as you move up the pyramid both the volume of traffic and speeds increase. New Urbanism is an urban planning movement centered on returning our towns and cities to the walkable areas they were prior to the ascendency of motor vehicles. From a bicycling perspective there is some conflict within New Urbanism since New Urbanism promotes an open grid street system which Dutch, Danish, and other countries have found incompatible with achieving high levels of bicycling. Can We Keep It Like This ?